I’m behind on my posts again! 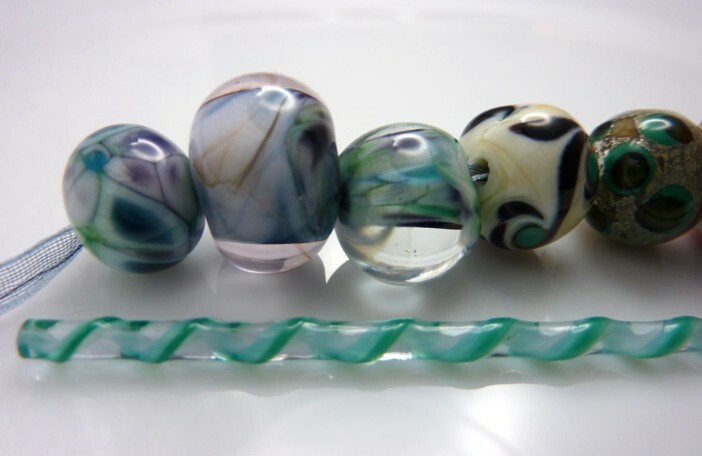 I had been meaning to show off some of the beads I’ve bought from other UK lampworkers before making this post, to demonstrate how they can look when you’re not a beginner! I have photographs I’m mostly happy with, all sitting on my laptop at home where they’ve been for most of this month. 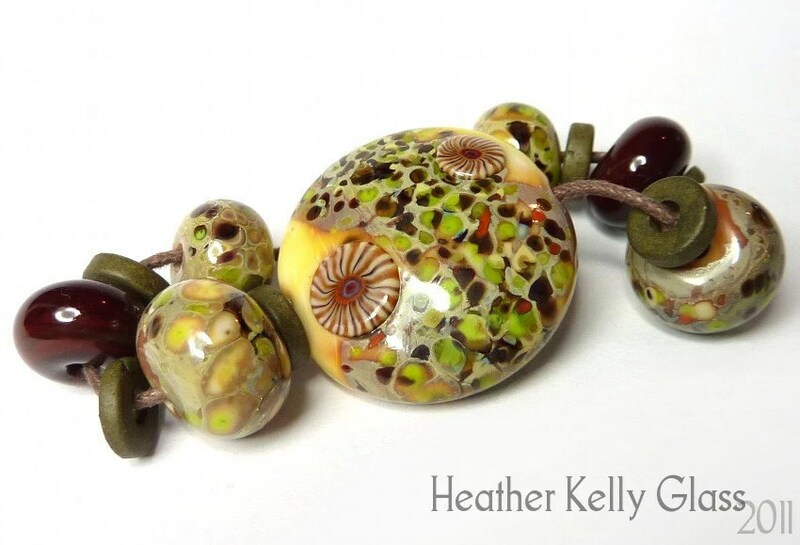 Ah well – instead I will direct you to the FHF Show and Tell where you can see all sorts of beautiful beads. (FHF = Frit Happens Forum, a place full of lovely people who like melted glass). Now, let me back up a step. 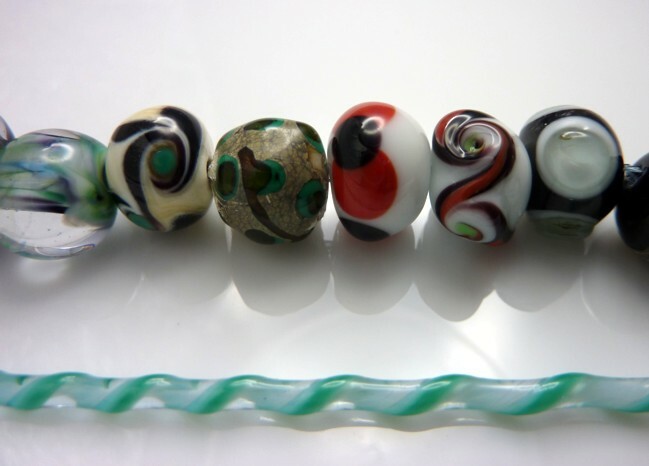 Lampworking is the art of melting rods of glass over a very hot torch and making beads or ornaments or sculptures or other such things. It tends to be called flameworking in the US. If you want to see some people doing it (it’s fascinating!) have a search on YouTube for lampworking or lampworking tutorial. There are loads of videos up there of people merrily melting away. 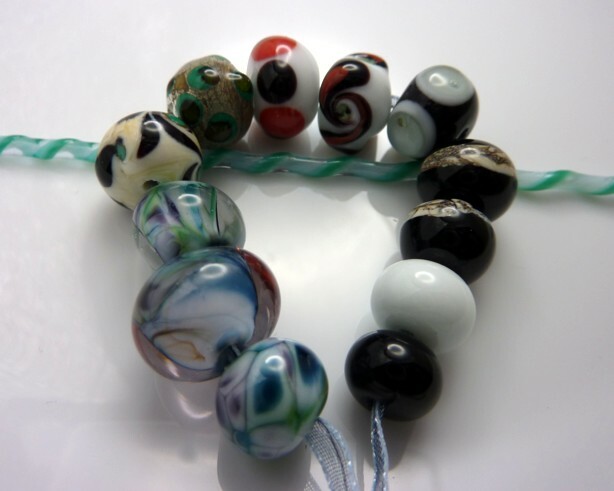 I fell in love with the beads, then started looking into how you made them… found the above forum, which is full of information, and began seriously looking into getting set up to make them myself. I had a day’s one-to-one lesson with Jolene of Kitzbitz Art Glass on Nov 6th. Here’s what I made! The little plain black one at the end was my very first, and the rest are more or less in order. I made a couple of them a bit (more) lopsided by putting them in the kiln while they were still too hot, so they sagged on the lower side. 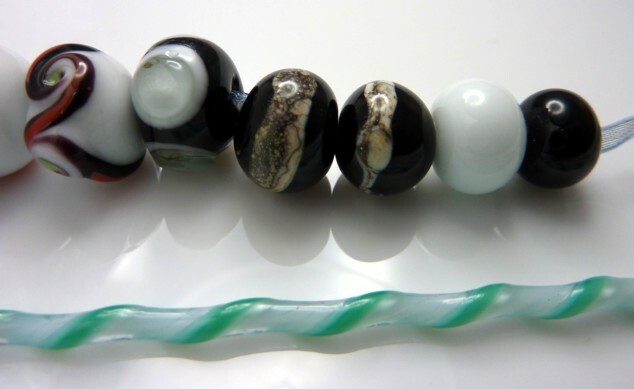 The thin twisted glass rod is called a twistie, and you use it for decoration of your beads. At the moment, my kit is here and I’ve put together a new set of shelves for the kitchen so that we can clear a nice big space on the table for me to work on. I have the bits and bobs for ventilation (though the supplier I bought my fan from sent me the wrong one! I’m trying to get that sorted out) and have found out where my local propane supplier is – a whole 5 minutes down the road. The local carpenter should be giving me a quote any day for constructing the enclosure for me to work in – I’m getting a 3-sided box with a top made that will sit on top of the table. The fan goes in the top to extract the fumes given off when melting glass, and will vent out of an old tumble drier vent in the outside wall. I’m getting there! I want everything ready before Christmas – we’ll see if I manage that. Once the fan and box are sorted out, there’s just a number of small things to get – propane alarm, extra G clamps, leather welder’s apron and glove, first aid kit for burns… and eventually a more organised storage solution for glass, but that’s not urgent. My glass rods are currently standing in empty pringles tubes! 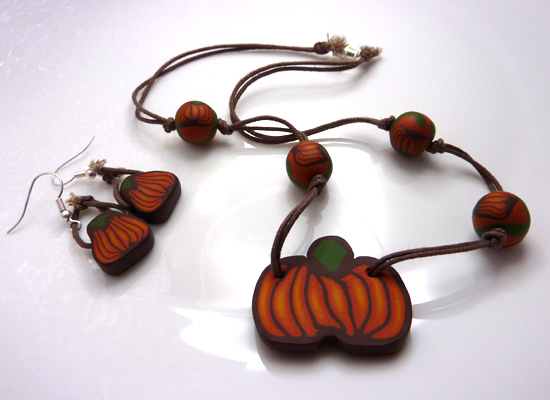 I made these pumpkin beads to wear to a Halloween party. 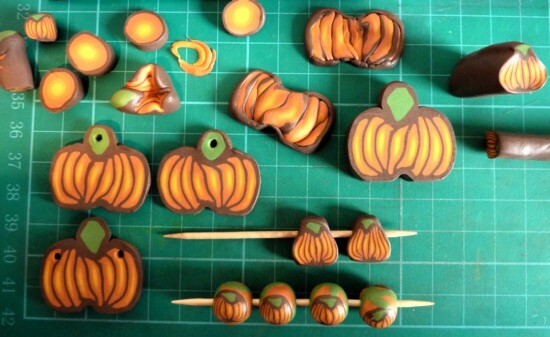 I used this tutorial from Polymer Clay Central to construct the cane, then reduced it to different sizes. You can see some of the offcuts and stages in construction in the first photo below, along with the beads ready to go in the oven. The beads were hurriedly baked the morning before the party, and even more hurriedly strung on brown cord. The earrings were put together once I’d actually arrived, so there wasn’t any opportunity for more than a basic knot. I’m going to redo them a little more neatly and also treat the cord ends to stop them fraying. I love the way that polymer clay lets you either blend colours by squishing them into each other, or lay them side by side, totally unblended. The moment of cutting the waste ends off a newly assembled or reduced cane to see the finished article is purely gleeful! I made these a few weeks ago. I wanted some purple or blue dangly earrings in a hurry, so I looked through my bead stash and grabbed these large deep blue gold-flecked vintage beads. I picked them up at a bead fair as part of a broken necklace, so I have a number in graduated sizes. 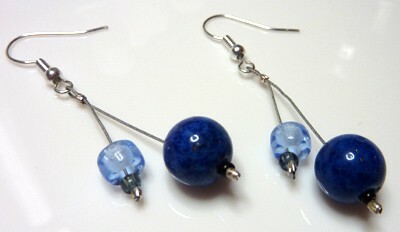 I paired them with light blue glass rondelles, threaded them on flex-rite with a little seed bead each, and crimped them. Hey presto, earrings! They’re just the right length, too. They dangle elegantly!